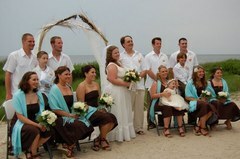 The ceremony was held on the soundfront beach. The weather was spectacular and the setting superb. What an awesome event home this is. We held an entire week of activities for our guests and everyone had an awesome time. The entire home and yard created an intimate setting for our wedding week. The rental company and the owner were attentive and responsive to all of our requests. Highly recommend this for a destination wedding. This is THE Perfect place to host a wedding week! Our friends and family really enjoyedit and it was perfect for setting up the right kind of atmosphere for all aspects... welcome dinner at the Love Shack, cocktail hour at the pool, dinner and dancing under the tent on the back lawn! Noone wanted to leave! This is definitely the PERFERCT place to get married. The house is amazing and the setting is beautiful!